Each year, the Branch observes United Empire Loyalist Day in Ontario on June 19th or the weekday closest to it. There are three flag raising ceremonies (in Lindsay, Peterborough and Port Hope) to commemorate the settlement of this critical mass of people in 1784 in what was to become the Province of Ontario. The Loyalists wished to live under British Law, to have Representative Government and the right of Individual Ownership of Land. These were the building stones in the founding of the Province of Ontario. 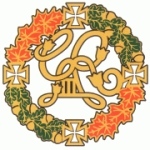 We support the UELAC curriculum initiative to teach Loyalist history in Ontario Public schools. 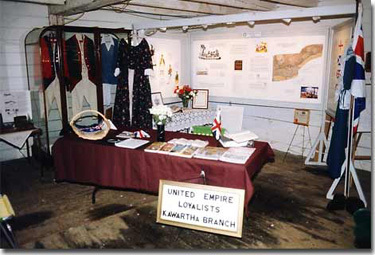 Kawartha Branch has members who speak on Loyalist history and themes. Plus, Members also participate in Pioneer / Settlement Day activities in period costume including a display booth to complement the activities. For viewing, we have Loyalist videos and a slide presentation. Kawartha Branch offers for sale books written by author Connie Brummel Crook UE which have a loyalist theme. As well a teaching guide is available with each book upon request. Flight, the story of a 14-year-old boy from a Loyalist family left behind rebel lines and his struggle to rejoin his family. Meyers' Creek, the story of a nineteen year old Loyalist girl, longing for adventure and for freedom to live her own life in the year 1786. Laura's Choice, a new story about Laura Secord and her heroic adventure.